Our sails will protect you from the sun and the wind without obstructing your eyes. 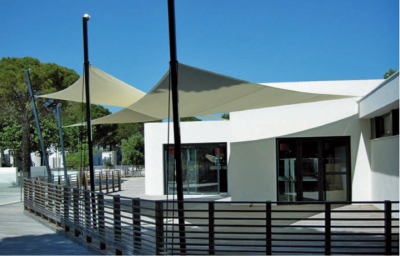 Our sails are made with a micro perforated fabric that has the particularity to provide a light shadow, to cut the wind and to provide an optimum comfort allowing to the ventilation of the underside of the fabric, thus avoiding the accumulation of heat. The perimeter and angles of our sails are reinforced by polyester webbing. This system limits the stress on the fabric itself and ensures perfect tensioning. In order to allow their fixing, we install welded triangles in 316 stainless steel (A4) at the angles taken from the straps. Characteristics of the fabric: Dickson Sunworker Open micro-perforated canvas, 360g / m.
Resistance to tearing: chain 50 daN / 5cm - Frame 30 daN / 5cm. Fireproof fabric: Removes glare and guarantees visual comfort under the fabric. Filter heat from solar radiation up to 81%. Blocks UV rays at a minimum of 79%. Simple and practical cleaning with soap and water. The choice of different colors will personalize your environment.